This was posted on March 3, 2014 by Mary. Have you ever wished you could sit down with the Duggar girls and talk to them face to face? Now you can do the next best thing. 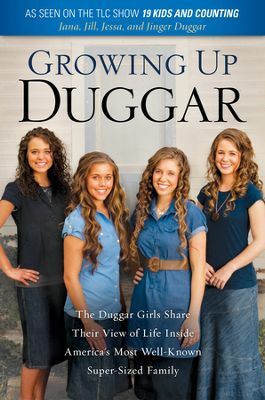 The oldest four Duggar girls have just written a book called Growing Up Duggar. We were privileged to be able to review a pre-release copy of the book. I was so encouraged reading Growing Up Duggar. It is like sitting down with Jana, Jill, Jessa, and Jinger and then being able to talk for hours and hours. Not only does it have many of their personal stories, but it also addresses the things we, as young women, can struggle with. Relationships is the overriding theme of the book, and I found myself relating to many of the topics. I appreciated their take on their relationships with their parents, because it is much like our family. Sadly, this vital relationship is often neglected in too many families. I smiled through the stories of sibling squabbles, which reminded me of those days in our family. They shared how they practically worked on eliminating sibling rivalry. I was encouraged by the practical tips to be more positive. The Duggars are amazing examples of finding the good in people and situations. The Duggar girls told about their struggles with self-acceptance—something many young ladies face. In this day where beauty is idolized, they discuss the importance to accept ourselves as God created us. These are just a few of the areas addressed in Growing Up Duggar. It is an encouraging book about how the Duggar family of 19 kids operates with much biblical and practical counsel. I would recommend you pick one up and read it. I have my ebook on pre-order. Looking forward to reading it. I had the privilege of being a guest in their home one Sunday for home church. The Duggars were very hospitable and the entire group was a blessing to be around. We are looking forward to reading this as well! Thanks for your thoughts! This book looks so encouraging! I haven’t gotten the book yet but I can’t wait to get it. I will Lord willing see them this Wednesday in Jackson MS!! So excited! !